Public Hearing on LA Mural Ordinance: July 12th - Yo! Venice! 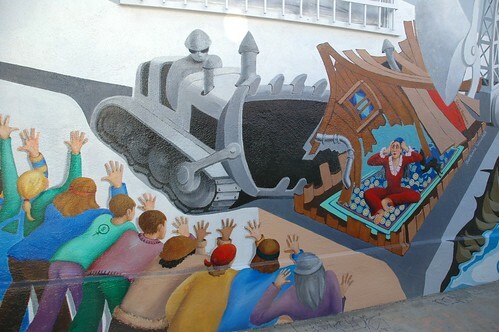 Public hearings for a new mural ordinance for the City of Los Angeles will be held July 12, according to a recommendation report about to be released. It marks the final steps to put definitions of Original Art Mural on the books, replacing the old definition of a “mural sign,” plus add new definition of “Public Art Installation” so public art will not overlap with City of Los Angeles regulations on commercial signage. As reported here, the administration for permits for Original Art Murals on private property will be handled by Department of Cultural Affairs (DCA), who will be given a set of guidelines that are “clear and consistent procedures” for new and existing murals on private property on city limits. With fees set on a scale topping at $100, the ordinance requirements for Original Art Mural include that they shall not be altered, not exceed the height of the structure or 100 feet, not extend more than six inches from the building façade, and remain intact for a minimum of two years. Click here to continue reading this article at KCET.